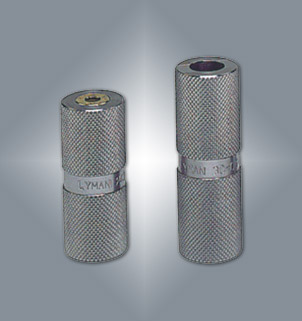 To achieve the highest degree of safety and accuracy, Lyman recommends that all bottleneck rifle cases be inspected after resizing to ensure that the proper headspace dimension is maintained. The best way to check this critical dimension is with a Lyman case length/headspace gauge. The reloader simply inserts the case into the gauge to insure that it does not exceed the maximum or fall below the minimum allowable headspace. In addition, the gauge will identify a case which exceeds the maximum allowable case length . Caution: Any case found with excessive headspace should be destroyed immediately.